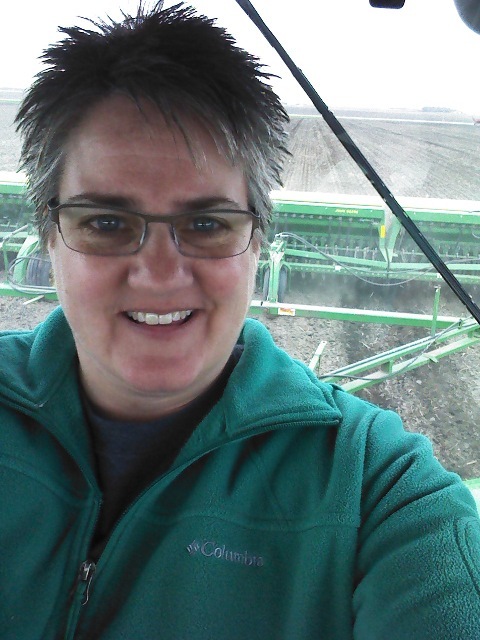 Day 12 of my 30 Days of Ag “All Things Minnesota Agriculture” is Carolyn Olson from Cottonwood, Minnesota (Lyon County). Carolyn and Jonathan Olson farm together. They raise organic corn, soybeans, and wheat on 1100 acres, and custom finish about 7000 pigs a year for a neighbor. As you read their story, you will notice how diversified their farm is. They grow organic crops and raise conventional hogs, thus farmers in two worlds. Even though today they farm in different ways, I truly believe these two worlds really will come together in one. In fact, I am see some of that happening now. 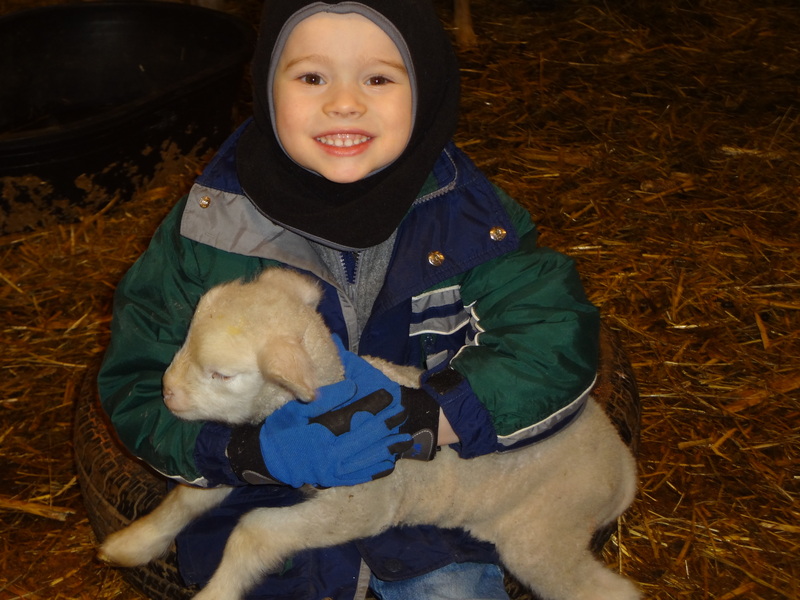 Jonathan has been involved on the farm his whole life. Carolyn started farming when they were married 26 years ago. 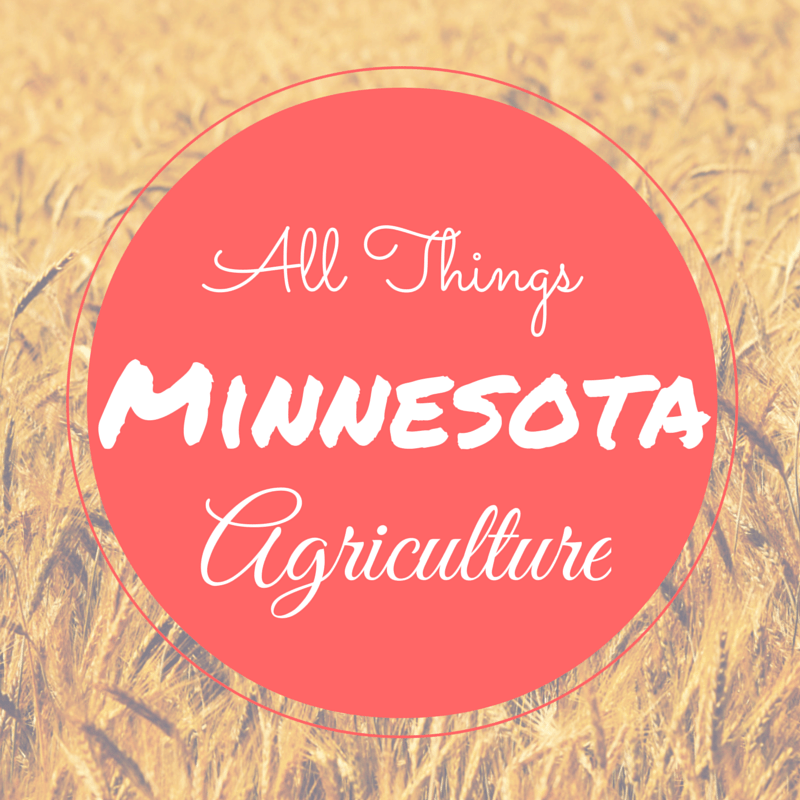 Their farm has quite the history as it has been in the Olson family for 101 years. 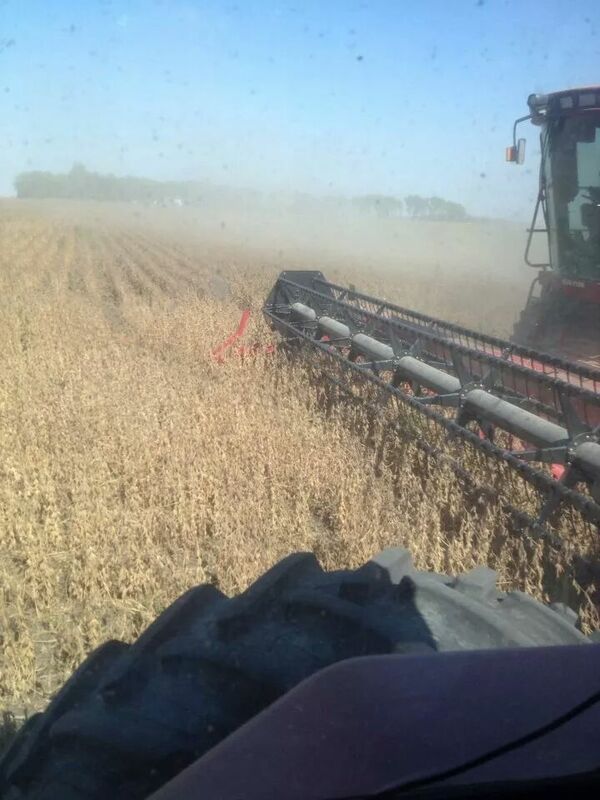 The Olson’s raise soybeans and wheat for seed for Albert Lea Seed in Albert Lea, Minnesota. Their crop is certified for seed production through the Minnesota Crop Improvement Association, and is certified organic. The corn is raised for animal feed, and vodka. I come to know Carolyn through agricultural organizations and social media. In fact, I think we conversed numerous times through social media before we met each other in person. Carolyn is very active in agriculture, both on the farm and off. And I love her blog, so take some time and check it out! I have also become more aware of the changing of the seasons, and what that means in the agricultural cycles. I love when the snow melts, and we start to work the soil in the spring. There is nothing better than the smell of freshly turned soil after a long winter. After all the seeds are in the ground, there is always an excitement when we can “row” the crops. Nurturing the crop during the summer, and watching the plants mature is satisfying. The best part of the growing season, though, is harvest. The busyness, seeing the result of all your hard work, and the feeling of accomplishment is unbeatable. Winter is a great time for us to recharge our bodies and our minds. We attend meetings, conferences, and learning sessions to help us farm ‘smarter not harder’. I guess you could say I love everything about farming. Day 11 of my 30 Days of Agriculture is Keith and JoHannah Klinghagen. 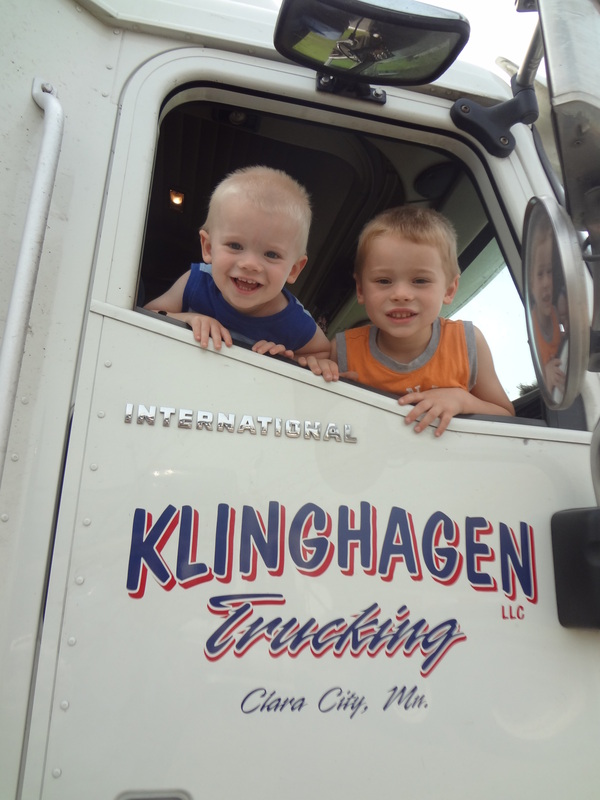 They are owners of Klinghagen Farms/Klinghagen Trucking LLC. 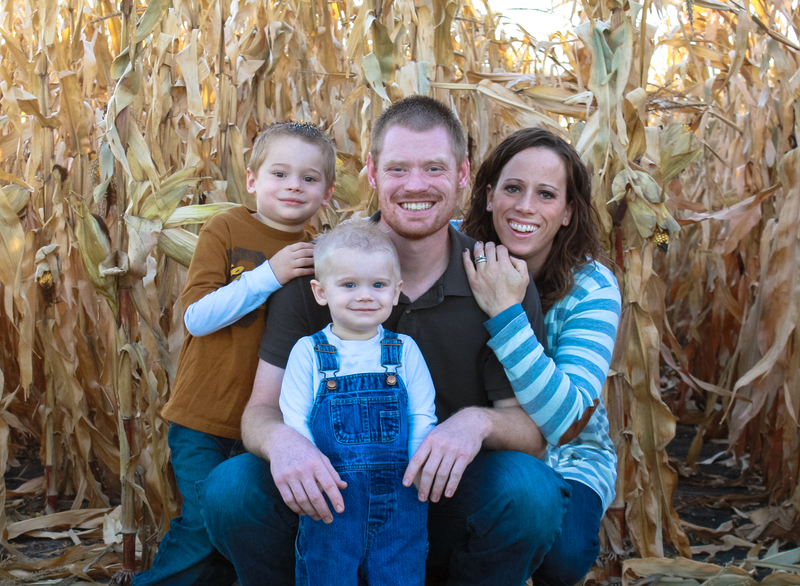 Keith and JoHanna have two children, Cooper (5 yrs) and Maverick (2 yrs) and live in Clara City, Minnesota. Their story is the epitome of the perseverance and determination it takes to be a beginner farmer. It’s not easy to start farming. But the Klinghagens have shown that it can be done. Read this great story of a beginning farmer! The Klinghagens raise sheep, hogs, cattle and run a trucking enterprise (no crops). 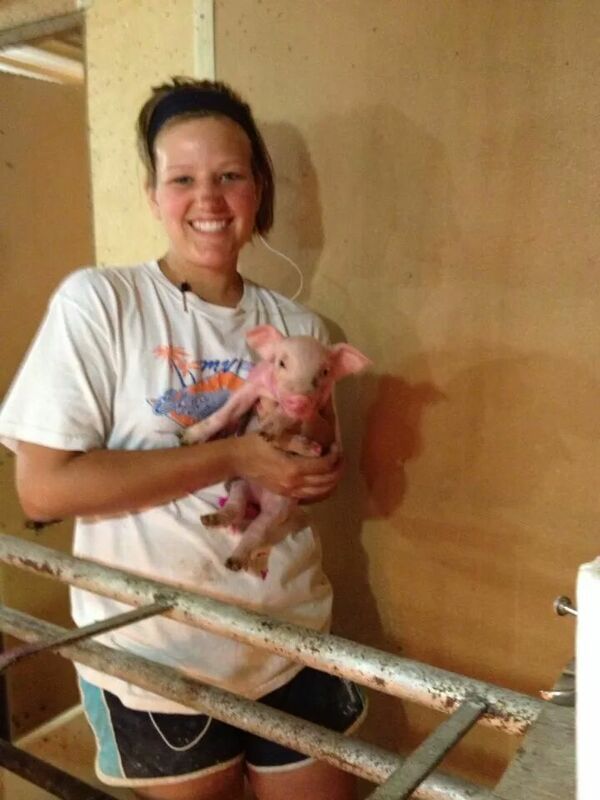 JoHannah is self-employed with a local hog integrator that she has worked for since she graduated in May 2006. 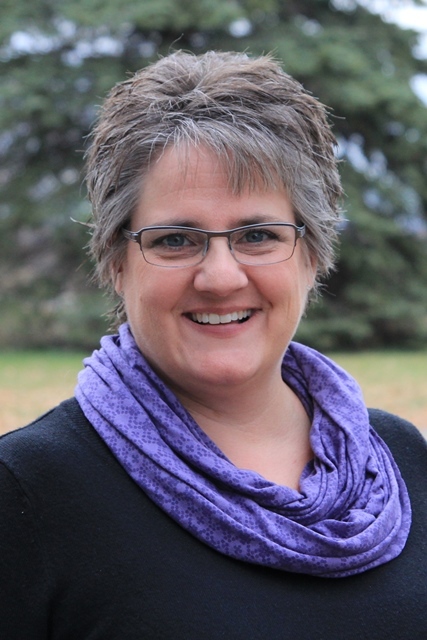 She currently manages 8500 nursery pigs in company owned or leased barns. She receives piglets weaned from the sow at 13 lbs and then takes care of them for the next 6-8 weeks or until they are about 50lbs. Keith manages their 2400 hd grow-to-finish facility they built in 2007 for the same integrator. 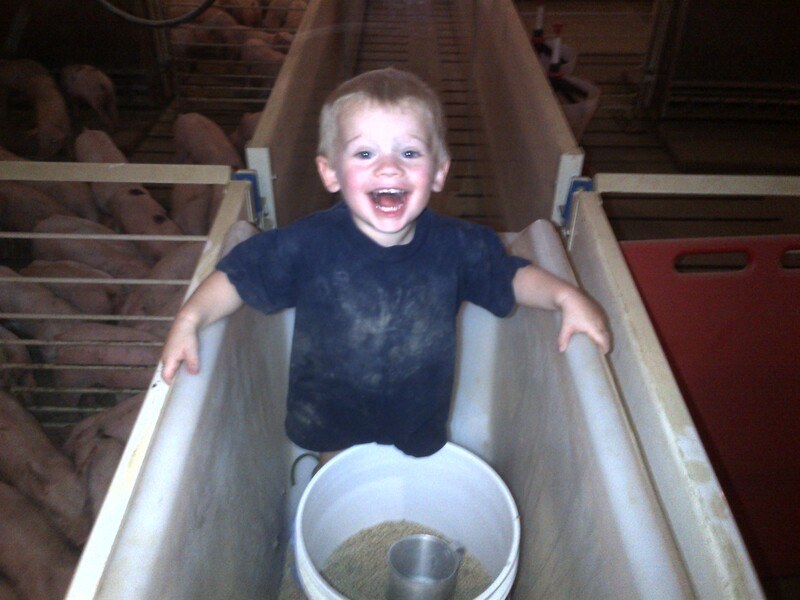 He receives the pigs she just raised in the nursery (50lbs) and finishes the pigs to 265-300lbs. Together they take care of cattle and sheep. Since Keith was in high school he has raised Holstein bull calves for meat. They buy groups of calves from local sale barns and/or dairies and raise them in huts for 7 weeks on a milk and grain diet. After 7 weeks they wean and feed them in a feedlot to 500lbs and sell to private buyers to finish for human consumption. Keith also manages a small fleet of trucks. At first they only hauled sugar beets from the fields to the beet plant for local farmers. Over the years the trucking business grew as they desired to make the trucks more productive all year instead of just during sugar beet season. They have hauled sugar beets, drain tile, straw and hay bales, grain dryers, livestock feed, feed ingredients, and machinery/equipment. Within the last two years they decided to put two trucks over the road (hauling within the United States) and they haul just about anything such as frozen food, dry goods, and cheese just to name a few. In 2012 they started their flock of sheep. They currently have 55 Polypay ewes they raise for meat. They lamb in March and at weaning of the lambs they determine if they want to finish out the lambs themselves or sell as feeder lambs depending on markets at that time. They keep back so many ewe lambs for replacement ewes every year to continue to grow the flock. We give our animals the best care/treatment we can provide. If that means penning up calves in the heated shop during a snow storm, bringing lambs into the house for a hot bath to prevent hypothermia, and getting up every two hours to check or feed then that is what we do. They are our responsibility and rely on us to take care of them. Next to our children these animals are our life. 1) People love pigs! And especially baby pigs! They love taking pictures of them. They love petting them. And they love watching them, especially during feeding time. 2) People love talking to farmers. They have questions and are truly engaged in conversations about pigs. 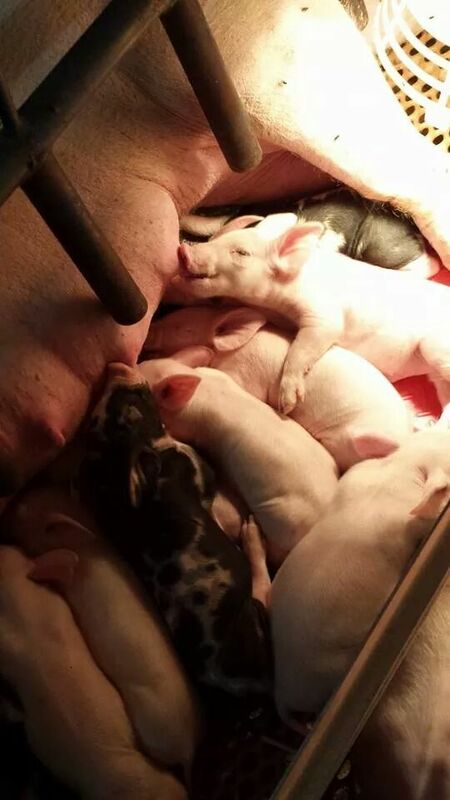 They want to know why the tails are docked, how many pigs sows have, how many litters she has in a lifetime, why the cost of bacon is high, how long it takes her to have baby pigs . . . And the list goes on and on. We both had many quality conversations with people who were genuinely interested in talking with us. Pretty cool. 3) A very, very small number of people have concerns about pig farming. Of all the people I talked with, only one person was a little upset by seeing mama sow in a farrowing stall with her baby pigs. I listened to her, looked directly at her and acknowledged her concerns. I pointed out we have common ground because we both are concerned about the sow’s well-being. Even though I knew I wasn’t going to change her mind, she now knows the face of a pig farmer. She also knows she was not disrespected or belittled for her concerns. Sometimes you have to start with small steps. 4) People don’t know much about pigs. They were amazed how fast they grow. 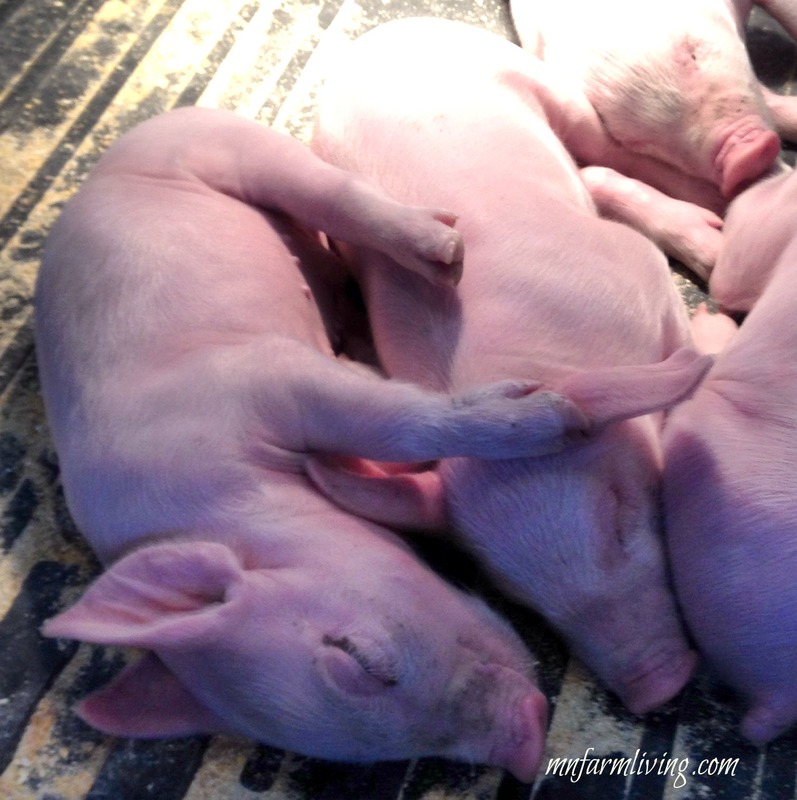 By next February, the baby pigs will weigh about 280 pounds (6 months of age) and ready for market. Even though some were a taken aback a bit when I added that when they are taken to market, we will all be enjoying pork chops, ham and bacon. 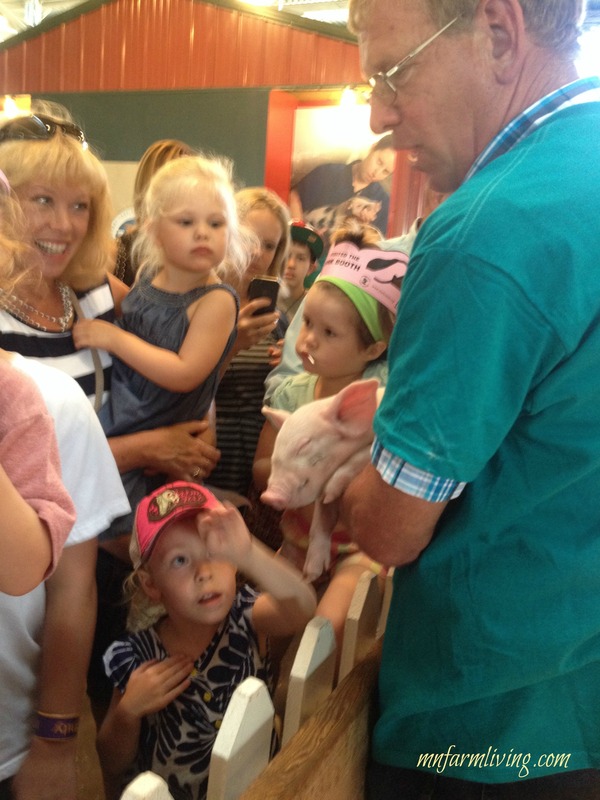 5) Working at the Oink Booth allows us as farmers connect directly with consumers. We both felt really good about our conversations yesterday. It’s pretty exhilarating when a complete stranger shakes your hand after talking with them and says thank you. And this happened more than once. We have a really big job of talking and connecting with consumers. Yes, it’s overwhelming, but we have no choice but to do it. And it’s going to take all of us. I encourage all farmers to take some time and talk with consumers. It’s rewarding and people truly do want to see the “face of agriculture” in an environment where they feel comfortable asking questions and sharing their concerns. And I have no doubt about that after yesterday!